CD review: "The Carols of Christmas II"
This review first appeared in the December 6, 1997 edition of the American Reporter. Each year round the time the Halloween decorations hit the local drug stores, we're besieged with another round of Christmas releases. The vast majority of them will be from sell-out Nashville models pretending to be country musicians  and not very well at that  butchering perfectly nice little traditional songs in the process. And so while news of Little Texas' breakup is certainly welcome (no more Christmas releases from them, at least ...), more so is the second installment of Windham Hill's "The Carols of Christmas" series. What makes this series special is that Windham Hill gets both mainstream and new age musicians and turns them loose on the most beloved of Christmas songs. Vol. II ranges from the easy listening of George Winston and Will Ackerman to the Top 40 arena pop of Loreena McKennitt, Janis Ian and Joan Armatrading to the experimental jazz of Steve Morse to the introspective meanderings of Leo Kottke and Liz Story. 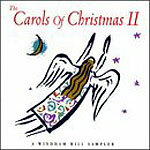 The songs include "God Rest Ye Merry Gentlemen" to "Away in a Manger" to "Oh, Come All Ye Faithful." Hardly a bad track here  listenable enough for relaxation, yet still demanding enough of your ear that it won't be content to stay in the background all the time.